Anyone managed to get SSH / Telnet access yet? It keeps refusing my credentials. Also changed the credentials and still no luck. quick question about the IPV6 settings, i dont know anything at all about how it works apart from that it's in base 16. But i've enabled the IPV6 settings on the local area network side and that seems functional. Can I set the IP protocol version seen below under the VDSL connection settings to 'both' and will the internet still work while there is no IPV6 on slingshots end? I dont want to muck up the DLM with me mucking around with the settings too much. There is no support for NAT64 which I can see and NAT-PT has been deprecated. Its either IPv4, IPv6 or dual stack (both). If your devices have IPv4 addressing, then it should work. Effectively, there is no point in using IPv6 right now until upstream (SS) supports it. Also just to note some of the pros and cons with this device. -ralink chipset seems to be a bit faster than the other DSL chipsets I have here. -Pings are better: 24ms to Auckland. (23ms to Slingshot network). It is 26-27 ms on the other chipsets I have. -Number of features is really good for a consumer grade product. my attenuation went up from about 9 to 18, but the speed stayed the same so one of my modems was lying. This is a sub-$100 router so is pretty dam good for that price point. It is cheaper than the Draytek and Zyxel equivalent. I haven't tried one out on a VDSL circuit yet but so far seems ok on ADSL. Haven't had a chance to look at it properly and do some proper tests but one day I will. SNR tweaking isn't something an ISP would want to make available in GUI format because everyone who thinks they know a thing or two would go and change it to 1 and then complain when the line drops out all the time. hamish225: my attenuation went up from about 9 to 18, but the speed stayed the same so one of my modems was lying. Mine increased from 11 to 14.2. I think the reason is this chipset looks at a different area of the spectrum for the attenuation, so reports back a higher attenuation. My perspective is that from an enthusiast type user. It is locked down by Slingshot so I guess good luck getting that info out of them. I have one with 'generic' firmware but what the guys have done is just simply carried over the telnet user from the Slingshot firmware because they didn't think it was important, this has caused them a few issues lol. What have people found with the ALG settings? Rather than just the normal on/off it is just a single check box. The SIP ALG is the one I am most interested in. I have assumed that ticked means on and unticked means off. However, when it is unticked I have trouble of multiple SIP registrations. So I have it ticked and it seems to work. Haven't done any packet captures to see what is actually happening though, that should say what is happening. Weirdly I seem to be getting better WiFi coverage from this $20 toy than my $200 Asus or my previous Netgear. Been pretty impressed with it so far - will have to run it for a bit to see if it is plagued by the reliability issues that seem to be a staple of these Telco offered clone devices. how do you work out what VDSL profile you're on with this modem? it doesn't tell you on the statistics page. Hey, I've got this new modem from Slingshot and just got my VDSL connected yesterday. Went from ~10 mbits to 35, so that's nice. But I would like to use the SAMBA service of this modem, but the option isn't there under the Advanced menu. I see that it should do according to the user manual from the website, but it's missing. Has anyone else got this problem, or know how to get it working? Newbie to this site but have been a webmaster for years dating back to the early BBS Days. Anyway was hosting 3x websites & 1x mail server with proper domain names on my Slingshot ADSL until i upgraded to VDSL earlier this week. Remember is has been working like clockwork for years.. I have all remote access control settings "Turned off" but can do the same with Local Access controls because if i turn off local access port 80 i can no longer access the router configuration..
Can anyone tell me how to setup the port forwarding to the above ports properly without the occupied by ACL! problem. At the moment i have to place my website outside the DMZ which i don't like doing. Anyone s help would be very greatly appreciated to allow me to get my server up and running properly again. It doesn't help that Slingshot cant provide a Router Manufacturer that i could contact for tech support. 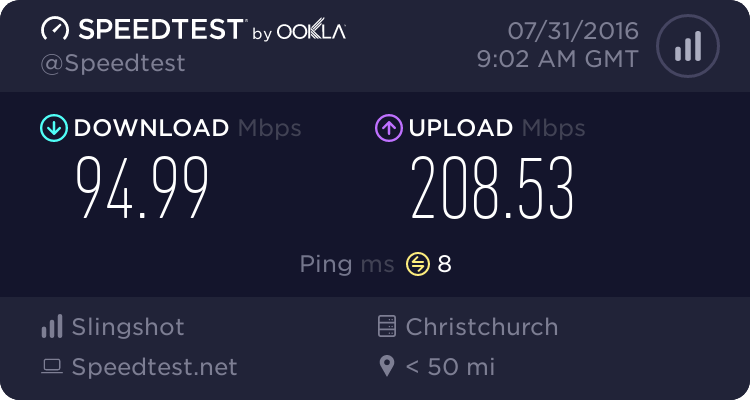 They told me that import the routers from China through a middle man who know nothing about them..
Hannesnz: Hey, I've got this new modem from Slingshot and just got my VDSL connected yesterday. NZCrusader: Any other unpublished links? Can you point me to someone who can help me with my problem above too please?